On Wednesday, Spencer Ackerman, who writes the Danger Room blog for Wired, peeked inside the classrooms at Quantico, when he published an overview of how at least one training course at the FBI Academy teaches that mainstream Islam is, by nature militant. Ackerman’s post followed by two days the release of a letter by Senators Lieberman and Collins – the chair and ranking minority member of the Senate Committee on Homeland Security – to Deputy National Security Adviser John Brennan, whose is a chief advisor the president on issues involving terrorism. That letter expressed the concern that conflating Islam with Radical Islamacism not only undermines the relationship between law enforcement and a community uniquely suited to assist in the fight against domestic terrorism, but risks obscuring the motives and plans of real terrorists. Ackerman does a fine job of putting those lessons into their larger context, and you can decide for yourself whether his observation that Quantico exists to impart practical investigatory skills – and not to foster academic debate – is exculpatory or damning. But whatever you decide on that score, you cannot help but marvel at the slides. Or at one slide in particular. The offending image was brilliantly lampooned by Amy Davidson in the New Yorker online Wednesday, and her observations regarding its “celestial decorative scheme” are priceless. Closer to worthless is the notion that anything as complex, nuanced or sprawling as thirty-five centuries of religious thought could be meaningfully summarized in the artifact reproduced above. And yet, someone tried. No modern presentation is complete without the soothing anodyne of Powerpoint, the Hamburger Helper of half-prepared speakers. What began as a visual aide to augment the white boards and flip charts that still adorn the back pages of office supply catalogs has come to define the artless craft of cobbling together disjointed snippets of information without the trouble of creating real synthesis. Edward Tufte – the high priest and genius of information design – has a monograph devoted to this topic, The Cognitive Style of Powerpoint, which you should read if you agree, and which you must read if you don’t. Arguments like that presented in the graphic above dwell at the intersection of two roads, neither fit for an intellectually honest traveler. The first is a broad highway – oversimplification – which delights in the graphic presentation of an idea that, expressed in words, would sound hopelessly simplistic. 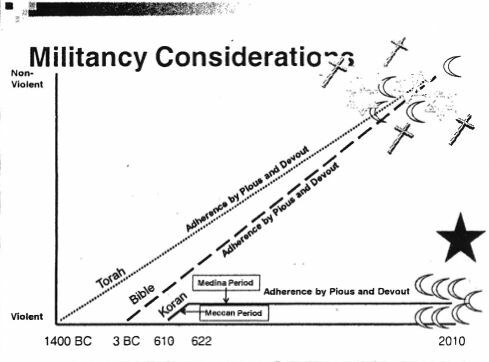 What do we know about Christianity, based on the chart above? Born in 3 BC, it is a faith of violent origins, beginning its life low on the y axis with such atrocities as the Virgin Birth, the Crucifixion of Christ, the martyrdom of the Disciples, the persecution of the Early Church and the rampages of the Church Fathers. Fortunately for the world on which it was loosed, Christianity evolved, walking an ever brighter path toward peace through the Dark Ages, the Crusades, the Medici pontificates, the Thirty Years War and the colonization of the New World by Spain. After twenty centuries of progress, Christianity today is a monolithic faith of supreme peace, that has long outgrown the internecine struggles of its earlier days. Unlike benighted Islam – which must have smoked in its youth, its growth having been stunted around 622 – the Church Universal is all grown up. Just like Judaism, which numbers among its adherents some of our best friends. To be truthful and revealing, data graphics must bear on the question at the heart of quantitive thinking: “Compared to what?” The emaciated, data thin design should always provoke suspicion, for graphics often lie by omission, leaving out data sufficient for comparisons. Graphics can display the quantitative size of changes as well as their direction. The standard of getting only the direction and not the magnitude right is the philosophy that informs the Pravda School of Ordinal Graphics. There, every chart has a crystal clear direction coupled with fantasy magnitudes. Subjecting the graphical object of our scorn to this critique is charitable, because it implies that its creator was more lazy that dishonest, and that with greater care he might have done a better job. But that is not so, not least because the underlying timeline shown for Christianity, the standard to which modern, militant Islam is being compared, is wildly ahistorical, to the point of being upside down. Another problem arrives by the second road along which our example dwells: the modern tendency to believe that complex trends and narratives – be they social, political or historical – are always amenable to quantification. Is Islam today more or less peaceful than in the time of Saladin? Compared to what? How do you measure the peace of a faith? In the number of its law abiding adherents? In the percentage of recognized leaders who preach the propriety of violence? In the number of those killed in its name? In the lines of text written in favor of the Jihad of the Sword, less the lines written in opposition? Whose voice counts? Osama Bin Laden? John XXIII? Or Leo X? Fred Phelps? Mother Theresa? Meir Kehane? Ian Paisley? John Brown? R. J. Rushdoony? Jesus Christ? Twenty-five years ago, I earned the lordly sum of $5.65 an hour as a research assistant at the Harvard Center for International Affairs, which was then led by the formidable political scientist, and founder of Foreign Affairs, Samuel P. Huntington. In 1987, Huntington was nominated for membership in the National Academy of Sciences, an honor which – despite his towering status as a social scientist – he was twice denied. The opposition to his membership was lead by Serge Lang, a professor of mathematics at Yale, who accused Huntington of practicing a sort of pseudo-science by attempting to quantify inherently subjective, and unquantifiable things. Huntington’s work was controversial on a number of fronts, and his support of authoritarian regimes in American client states during the cold war earned him no love among liberals. (He also had the only battle tank I have ever seen rendered in needlepoint framed on his office wall). The same question might be asked of attempts to quantify such variables as militancy, loyalty, and the inclination toward violence in the march of an ancient, fractured faith along the road to an undefined state of peace. There is a lot of mischief in that little chart. No shortage of comments have pointed out that it risks tarring the faith of millions of loyal Americans with the broad brush of radicalism. And it does. But it also betrays how facile our discussion of what amounts to radicalism has become, even among those who have every opportunity and incentive to know and do better. Which makes it yet another rhetorical warning sign on the road to stupidity.